We’ve all been there – you’re getting into the groove of things behind the booth, and then BAM! 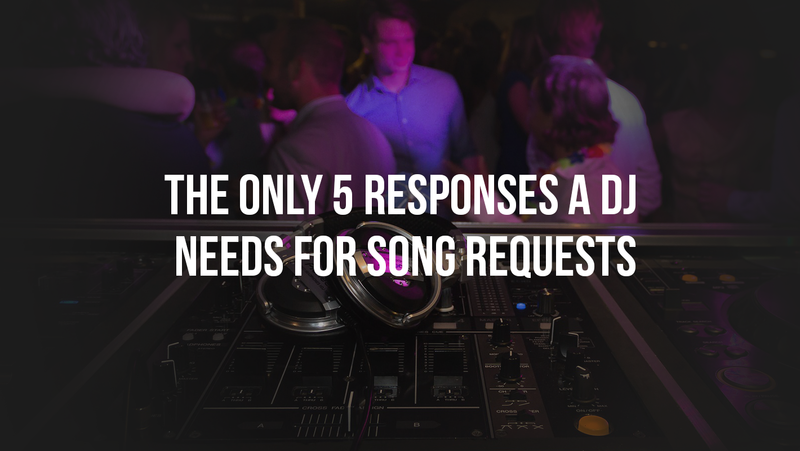 – the dreaded song request. It’s one of the things only a DJ will understand. Sometimes song requests are okay, but sometimes they are just plain annoying. Keep reading to find out our best advice for handling song requests. And take notes because these 5 responses are the only ones you’ll ever need. This is quite possibly the easiest response to give someone. Maybe the request is too big of a hit to play early on or it’s too low energy to play in the middle of your set. You can be honest and explain that the song just doesn’t fit with the moment. Give them a shred of hope and tell them you’ll try to fit it in later. The notebook response is actually a great tactic for weddings, private parties, or any special event. Keep a notebook and pen, or a clipboard with a pen attached handy at the booth. When guests approach you, point to the notebook and throw them a thumbs up just for fun. This way you don’t have to stop what you’re doing mid-mixing and the guest still feels like their request was heard. This tactic might seem like you’re encouraging requests, but it’s much easier than trying to hear someone yell their request over the music. You can even look at the list of songs later on and expand your music library for next time. So far, song requests don’t seem too annoying, right? Well, what happens when someone asks, “Do you have anything we can dance to?” This type of question usually comes from someone that likes electronic music but they’re at a hip-hop club or someone that wants to hear a song that’s not appropriate for the buttoned-up corporate event you’re DJing. Here’s where polite fibbing and a shoulder shrug come into play. Simply tell the guest that you don’t have that song. If the guest is persistent, just stick to your guns. And no, you can’t “just play it from YouTube,” because you don’t have Wi-Fi. Sorry! DJs are supposed to be crowd pleasers, but we are also professional musicians. Sometimes it’s okay to just say no! A situation where this response is acceptable is if the request is for a song you already played earlier in the night. Whatever the reason is, remember that you’re the one in control of the music. There will always drunk people, people who claim to be a DJ or people who have a very entitled attitude. Be sure to remain professional and keep your cool in these situations. It’s not worth your energy and definitely not worth losing a job over. If the request comes directly from the venue owner, the event host, or the bride/groom – then you’re going to want to accommodate. If you don’t have the specific song they want to hear, try suggesting another song that might work. Bottom line, be professional and show respect to the person cutting your check. Pretty straightforward – if someone suggests a great song and the time is right, you say yes! Let us know if you have a standard response to song requests. Do you usually accept them or is this a big no-no in your book?